Below is an email sent out to all subscribers of the band's mailing list in February 2015. Tomorrow Never Knows - February 2015 Here's a little update for you all. Not too chatty this time - a bit more of an info-blast... Firstly here's a handy pocket-sized list of all the currently confirmed shows: Friday 10th April: Coachella Festival, Indio, California SOLD OUT Monday 13th April: The Warfield, San Francisco TICKETS STILL AVAILABLE Tuesday 14th April: Fox Theater, Pomona TICKETS ON SALE NOW Friday 17th April: Coachella Festival, Indio, California SOLD OUT Friday 22 May: Barrowland Ballroom, Glasgow SOLD OUT Saturday 23 May: Albert Hall, Manchester SOLD OUT Sunday 24 May: Roundhouse, London SOLD OUT Tuesday 26 May: Paradiso, Amsterdam SOLD OUT Wednesday 27 May: Olympia, Paris TICKETS STILL AVAILABLE Friday 29 May: Primavera Festival, Barcelona TICKETS STILL AVAILABLE Tuesday 2 June: DanForth Music Hall, Toronto SOLD OUT Thursday 4 June: Terminal 5, New York SOLD OUT Saturday 6 June: Primavera Festival, Porto TICKETS STILL AVAILABLE Sunday 7 June: Field Day, London TICKETS STILL AVAILABLE There are a couple more in the pipeline that we're hoping to confirm in the next few weeks so keep an eye on our Twitter and Facebook. Full rehearsals start in earnest at the beginning of March. Any requests? The ticket lottery for Andy and Mark's War Child acoustic show at the 100 Club in London on Thursday 19th is still open for a couple more days. Enter now if you want to stand a chance of getting yourself a pair of tickets. 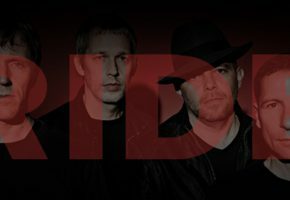 The band have just done a series of interviews for a new edition of the Ride fanzine The Network as well as a photo session with the legendary (and extremely wonderful) Piper Ferguson. We're starting to have a think about what merchandise to put together for the tour dates. Any old favourites that you'd like to see reissued? Any cool items that you'd like to see a RIDE logo emblazoned across?